Soon Balint’s old fiacre, moving slowly, was overtaken by all sorts of other vehicles, some driving so fast that he could only occasionally recognize a face or two before they too were swallowed up in the dust. Our first portrait of our hero is of him being passed by, slightly out of sync with and nostalgic for a world speeding toward oblivion. One could also read Balint’s glacial pace as a self-reflexive statement, a reminder for us to settle in for the extended pleasures of the three-part epic about to unfurl. The trilogy, published last year in two volumes by Everyman’s Library and translated by Patrick Thursfield and Katalin Bánffy-Jelen, is a political novel, a melodrama, and a masterful social comedy. 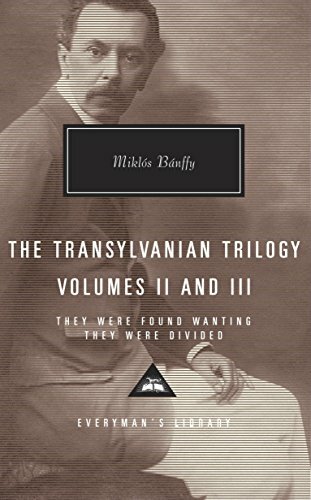 Written by the aristocrat, painter, and statesman Miklós Bánffy, the volumes were originally published between 1934 and 1940, just before Hungary was about to be torn apart by yet another world war. Then lying in the southeastern portion of Hungary (and now a part of Romania), Transylvania had for centuries been “a highway whose path was trodden by countless nomads who came that way and then passed on.” Its rulers maintained a fierce independent streak whether as a semi-autonomous vassal state under the Ottomans or as part of the Austro-Hungarian Empire, which explains Abady’s sensitivity to the perception that Transylvania is “just one of a string of otherwise insignificant provinces.” (One Budapest woman asks him, “Lots of bears where you come from, aren’t there?”) It is worth noting that another great chronicle of the Austro-Hungarian Empire’s implosion, Joseph Roth’s The Radetzky March, concerns a family with origins in a similarly peripheral territory — Slovenia. The central love story concerns Count Abady and the “strange, independent” Adrienne Miloth, a striking beauty married to a chillingly refined monster, Pal Uzdy. (Uzdy — insane, sadistic, and a crack shot — wouldn’t be my first choice of a man to cuckold, but then certain Transylvanian counts are known to have eccentric tastes.) Brutalized as she is by her domineering husband, it takes the entire first volume for Adrienne to respond to Abady’s cautious advances with anything less than revulsion. The further two volumes track the lovers’ frustrated efforts to wed and give Abady a much-desired heir. The secondary protagonist, Laszlo Gyeroffy, Abady’s cousin, is an orphaned musician (he and Abady are conspicuously fatherless). As Abady muddles his way through Hungarian politics and peasant intrigues, Laszlo first becomes an elotancos, or “leading dancer and organizer” of all the balls in Budapest, a combination of bandleader, socialite, and perfect wedding guest. Letting his musical talent go to waste, he becomes known for his reckless gambling and drinking, two habits which set him on a debauched decline even as a succession of smitten and rich women attempt to save him. He wore the rimless eye-glass attached to an almost invisible silken thread, and when he put it up to his eye he could express an infinite variety of opinion merely by varying the gesture: comic surprise, irony, increased interest or incipient boredom, appreciation of a woman’s beauty or reprimand for a man’s presumption…His timing was inimitable and it was widely recognized that Neszti’s monocle was as much the symbol of his sway as was the scepter of kings. These and other perfectly drawn caricatures, including an Austrian lothario nicknamed Nitwit, a rich Croatian known as the Black Cockatoo, and a lisping chauvinist who resembles an “enraged hamster” when dueling with sabers, are predictably present at social gatherings to liven things up. Abady strives towards the sublime but finds himself mired in the ridiculous: dysfunctional legislative scenes, buffoonish pranks, the collapse of his well-intentioned efforts to establish a co-operative on his mountain holdings, officious wrangling over duels that are themselves absurdly anticlimactic. He is disgusted by the crass political maneuverings he encounters in Budapest and the corrupt practices in his home province, which he sees as his duty as a nobleman to correct. His political speeches go largely ignored, and the wary Romanians in his mountainous forest district listen politely but resolve to wait the “strange lord” out until he returns to his Denestornya estate or Budapest. What he has been dreading has finally come into view. The sad truth was that all of them found anything that did not concern their own country fit only for mockery and laughter. To them such matters were as remote from reality as if they had been happening on Mars; and therefore fit only for schoolboy puns and witty riposte.